Pack your bags because it’s time to discover ‘The Hawaii of Japan”, Kagoshima! If it’s not your first trip to Japan and you want a different experience other than Tokyo and Kyoto, Kagoshima is the right place for you to visit. Kagoshima is located on the Southernmost part of Kyushu and it’s called the “Hawaii” due to it’s volcanic tropical paradise, just like Hawaii! It may sound like its far from the big cities, worry not as you can travel to Kagoshima from Osaka cheaply by bullet train *yay* All you need is a JR Pass and you can travel anywhere in Japan, even by Shinkansen(bullet train)! There are so many things to do, but here’s a sneak peek of how you can enjoy Kagoshima, the volcanic tropical paradise. Come and start the adventure with NyaRan cat! Issie-kun, who? If your guess is a human, *buzzer* its actually a loch ness! Issie-kun is a legendary creature that is rumoured to be lingering in the sea (yeap 233 meters deep). If you’re a Doraemon fan you might remember that Nobita & Doraemon found a loch ness called Nesshi-kun in a lake nearby, and well apparently Issie-kun is like its family! Fun fact, Lake Ikeda is the biggest caldera lake in Kyushu and was formed over 6,400 years ago by volcanic activity. Spring comes early in Kagoshima! Other than saying hello to Isshi-Kun, you can also enjoy the early spring at Lake Ikeda, Ibutsuki! Here you can enjoy a large field of “Nanohana”, a yellow flower that can be seen all around Ibutsuki City. The best time for you to visit Lake Ikeda is between January – February where you get to experience the combination of Nanohana in full bloom, clear blue Lake Ikeda, and the lush greeny Mt Kaimondake! If you’re around Ibutsuki, make sure you stop by at Tosenkyo Somen Noodles and experience lunch like the true Kagoshima-ians! 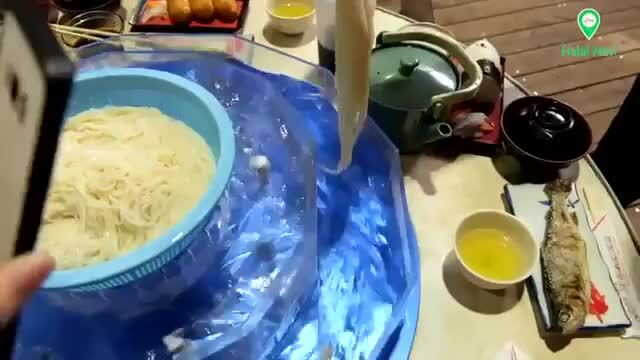 Nagashi Soumen (flowing noodles) is a famous dish in Japan especially during Summer because it is very refreshing, but in Kagoshima, it’s a year-long dish. Although not all Nagashi Somen in Japan is Halal because of the broth used as the dipping sauce, Tosenkyo Somen Noodles offers a Muslim-friendly menu upon reservation! Other than enjoying fresh noodles in the deep forest, you get to also enjoy a typical Japanese lunch from 1,000Yen. It comes with freshly grilled fish , some onigiri, miso soup and condiments so you get to eat till your stomach burst! Access Tosenkyo Somen Nagashi is 30 minutes by Kagoshima City bus from Ibusuki Station. Get off at Tosenkyo (Tosen Gorge). Welcome to the southernmost train station in Japan! Get excited because you’re about to witness the amazing view of the Kaimondake volcano aka ‘Satsuma Fuji’ live in action. Mt. Kaimon is called Satsuma Fuji because it looks like the oh-so-famous Mt. Fuji! So don’t be sad if you didn’t get to see Mt. Fuji, cause there’s another Fuji in Kagoshima! 1 hour and 30 minutes from Kagoshima Chuo Station by bus or train. 17 minutes train ride from JR Ibusuki Station, but please opt for another option due to the infrequent train service. Opening Hours Open throughout the year, but the travel guide station open from 8:00 until 17:00 (no holiday). While being mesmerized by the scenery, you can send your happiness to your loved ones! Purchase postcards from the store called “Kyutaro Nakazono” located in front of the station and drop them at the magical yellow postbox near Nishi-Oyama Station, called the “Yellow Postbox That Sends Happiness” ! Opening Hours Open throughout the year, but the travel guide station opens from 8:00 until 17:00 (no holiday). If you plan to visit Kagoshima, your trip won’t be complete without getting steamed like a pau inside the sand bath. The sand here is not your typical sand as it’s temperature can go up to 50 °C! Which is why this is the best place to get steamed as you will be covered by hot sand, front and back, for about 10 minutes, and all your dead skin cells will generally come off leaving your skin refreshed! Will close early during peak season. Temporarily closed for equipment inspection on Tuesday on the second week of July and December. After coming out from the sand bath, your mind and body will feel refresh but your stomach will growl for sure! 6 min from JR Ibusuki Station – JR Yamagawa Station (JR Ibusuki Makurazaki Line) one way. 26 min by from Ibusuki-ekimae bus stop, alight at Fushimeguchi bus stop and walk for about 11 min. Are you a World Cultural Heritage Hunter? Well, come and explore Sengan-en Garden, which has been around in the Shimadzu family for over 350 years! If you’re near Kagoshima port, make it as your first destination to explore in Kagoshima! We advise you to spend more than 1 hour here as the park is so huge! Not only you can enjoy the nature that surrounds it and a clear view of Sakurajima Volcano and Kinko Bay, but you get to experience yourself how Prince Shimadzu lives 350 years ago while strolling inside their house. Other than the traditional architecture, you can also hike the hills inside the park for a better view of Sakurajima. To enjoy Senganen to the fullest, visit the garden in November to enjoy the full bloom and colourful flowers during their annual Chrysanthemum Festival. 30 minutes by bus from Kagoshima Chuo Station & get off at the Sengan-en Mae bus stop. 10 minutes by bus at Kagoshima Station & get off at the Sengan-en Mae bus stop. 40 minutes by taxi or car from the airport, take the Aira Expressway Route 10. Take 15 mins ride from Sakurajima Ferry – Sakurajima footbridge (10 mins walk) – Kagoshima Aquarium bus stop (Suizokukan Iriguchi – 10 mins by bus) – Sengan-en Mae bus stop. It may sound intimidating to stroll around an active volcano but it will be the best part of your Kagoshima trip! You can take a ferry ride near Senganen Garden, either with your car or just you. This ferry will take you from Mainland to Sakurajima, an island with an active volcano. We advise you to sit on the deck view on the upper floor so you can take in the view of Mt. Sakurajima, just waiting for you! Upon arriving at Sakurajima, you should make stop at Sakurajima Visitor Center to learn more about the history of Sakurajima Island and then treat yourself with warm foot bath, just a minutes walk to Sakurajima Yogan Nagisa Park Foot Bath! Not only you get to warm up your feet but you get to warm up your eyes with the beautiful view of Kagoshima mainland and also Mount Sakurajima and guess what? It’s completely free! Just don’t forget to bring a towel to dry off your feet afterwards! Sometimes you need to be one with nature and Takachiho farm is perfect place! There are tons of activities to do such as ice cream or butter workshop, petting animals and also milking the cows. If that’s not enough, you can just sit around and enjoy the view of Mount Kirishima with a fresh handmade ice cream in hand. Isn’t that just too awesome? Admission fee Free entrance *Each workshop have their own fees. So are you ready to pack your bags and head down to Kagoshima for an adventure? If you are, don’t forget to purchase your JR Pass so you can travel to Kagoshima from Osaka in just 4 hours by bullet train! Not only you get to travel to Kagoshima by bullet train, you get to travel anywhere in Japan using this JR Pass for the price of one. All you need is to visit this link and purchase it online before your trip!